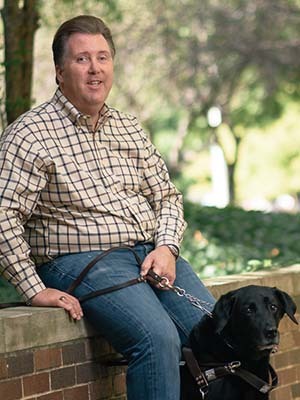 Donald Barnes received only one diploma when he graduated from Krannert’s Executive MBA (EMBA) program in May 2016, but he happily shares it with his service dog, Linden, a black Labrador who has been at his side for nine years. A rooms reservation agent with MGM Resorts International in Las Vegas, Barnes was diagnosed at age 15 with retinitis pigmentosa, a degenerative eye disease that causes severe vision impairment. On the job, Barnes uses JAWS (Job Access with Speech), a screen reader and software tool for computer users whose vision loss prevents them from seeing content or navigating with a mouse. Although Linden wasn’t even a pup when Barnes earned his first Purdue degree in hospitality and tourism management in 1993, he was indispensable during the EMBA program, which includes five residencies on the West Lafayette campus and a sixth at an international location. The first month of the program left them both feeling anxious, Barnes admits, but ongoing support from Krannert faculty, staff and his EMBA classmates helped guide the way to success. Barnes is still smiling today.